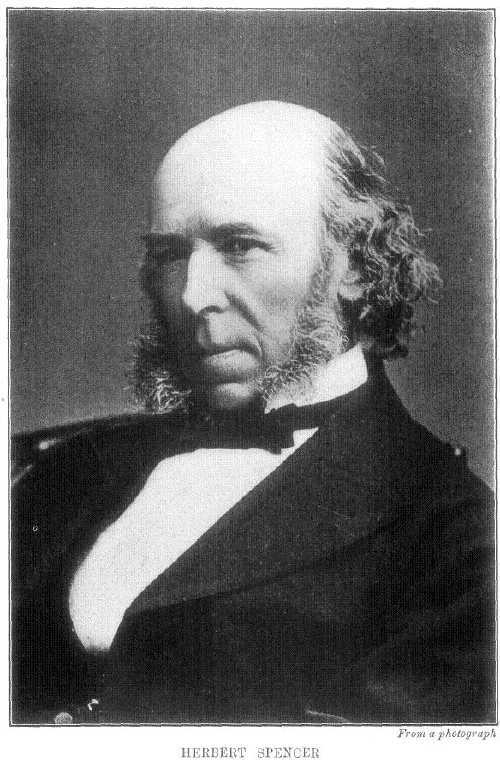 Many geoists will be spluttering into their cornflakes when they see Herbert Spencer getting this gig, but there are instructive reasons why his life should be examined. For, unlike anyone in world history, Spencer “saw the cat” and used his fame to advocate geoist reforms ….. then later sold out and recanted. Let’s unpack the bizarre personality that was Herbert Spencer. And he was big in his day – by the 1870s and 1880s this classic-liberal political theorist had achieved an unparalleled popularity, being possibly the only philosopher in history to sell over a million copies of his works during his own lifetime. How Spencer had achieved such a meteoric rise from unconventional beginnings also tells much about the man. He entered a family of dissenting clergymen and teachers in which a long opposition to State-Church ties and solid identification with the rising commercial classes had bred a strong anti-statist individualism. Spencer’s father, who ran a school founded on the progressive teaching methods of Johann Pestalozzi, was a religious dissenter who drifted from Methodism to Quakerism, and who seems to have transmitted to his son an instinctive opposition to all forms of authority. As both an adolescent and a young man Spencer found it difficult to settle to any intellectual or professional discipline. He worked as a civil engineer in the late 1830s, while also devoting much of his time to writing for provincial journals that were nonconformist in their religion and radical in their politics. From 1848 to 1853 he served as sub-editor on the free-trade journal The Economist and in 1851 published his first book, Social Statics (which explained the radical injustice of our system of land tenure), when he started to rise to prominence as a philosopher. A full seven years before Charles Darwin published Origin of Species, it was Spencer and not Darwin who first popularized the term “Evolution”, and coined the term “survival of the fittest”. His work significantly influenced 19th-century developments in biology, psychology, sociology, and anthropology as well as exerting great influence on literature and rhetoric. The most famous philosopher of the age initially defended a number of radical causes though he came to abandon most of these causes later in his life – in fact, many were to later enthusiastically embrace Spencer’s “Social Darwinism” to justify laissez-faire, or unrestricted, capitalism. Yet look at the quotes above – just a small sample of Spencer’s clear geoist thinking ….. in his *early* life. How can anyone apparently understand geoism and then sell out by disavowing what he stood for? From a close reading of Spencer, here’s my understanding of what happened. Firstly, little Herbie was a frail and sickly kid (all eight of his other siblings died at a young age – what sort of cook was his Mum?) and his constitution remained weak throughout his life. He would later suffer from nervous breakdowns from which he never recovered; he suffered from chronic insomnia; he could only work a few hours a day. To help matters along he used fairly substantial amounts of opium, so it’s no surprise that he experienced a strange sensation in his head which he called “the mischief”. And our Herbie was also known for eccentricities like the wearing of ear-plugs to avoid over-excitement, especially when he could not hold his ground in an argument. From about 1855 he began to experience serious (predominantly mental) health problems that affected him for the rest of his life. This led him to seek privacy, and he increasingly avoided appearing in public. However much this contributed to his mental state, Spencer’s thinking became rather illogical – even nonsensical – as he grew older. These flaws have been highlighted in detail by esteemed thinkers such as Alfred Russel Wallace – hey, Henry George (who had met and admired the “earlier” Spencer) himself wrote a whole book (A Perplexed Philosopher) about Spencer’s sell-out. As years went by, Spencer’s unquestioning confidence in his own views was coupled with a stubbornness and a refusal to read authors with whom he disagreed, and his political views became increasingly conservative – for instance, he did another flip and became a staunch opponent of female suffrage. Soon after his death his philosophical reputation went into a sharp and irrevocable decline and his work was widely dismissed as a ‘parody of philosophy’.